My friend is in town this week and so we have been travelling all over Seattle checking things out. 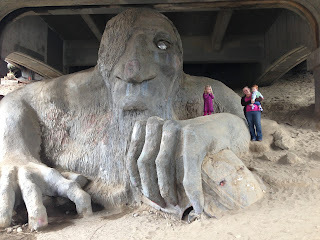 Today (it's still today for 50 more minutes), we headed down to see the troll under the bridge. It was pretty awesome. Lucy didn't think it was all that great, mainly because she was mad at me that I wouldn't let her play in the sand. There are just some pretty awesome stuff here in Seattle. Some seriously awesome stuff. And it's just so freaking cool going and checking out what this city has to offer.